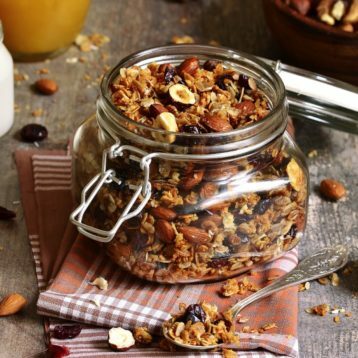 This homemade granola is the perfect energy boosting breakfast recipe packed with oats, nuts, flax seeds, chia seeds and even chocolate! This recipe makes a large batch which can be stored in a jar or airtight tub to use throughout the week. This recipe was kindly shared by food blogger EpiVegan for our vegan meal plan. Click the logo below to check out Brett's website! Mix together the oats, pecans, walnuts, flour, salt, and cinnamon and set to one side. Whisk together the olive oil, maple syrup, and vanilla until smooth. Pour the oil mixture over the oat mixture and stir fully combined. Spread the mixture evenly on to a rimmed baking sheet. Make sure it covers the area and is not piled over itself. After 40 minutes, remove from oven and let cool completely. Add in the chocolate chunks and combine. Serve with non-dairy milk or yogurt and fruit of your choice!